"Timely and valuable, [Regulating Wall Street] should be required reading forall policymakers, investors, and students of finance. 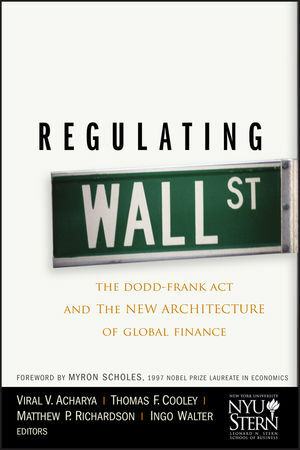 [The book] not only analyzes the scope of the [Dodd-Frank] Act...it also discusses its potential impact. More important, the book analyzes what is not covered in the Act - and where the potential challenges to the financial system still lie." In Regulating Wall Street, leading academics from the New York University's Stern School of Business turn their attentions to the first in-depth independent study of the Dodd-Frank Act. The U.S. Congress has passed the most significant changes in financial regulation since the 1930s with the Dodd-Frank Act. This research discusses whether the resulting regulations will promote growth and prevent another near collapse of our financial system, or contribute to its catastrophic failure. In Regulating Wall Street: The New Architecture of Global Finance, an impressive group of the Stern school’s top authorities on finance combine their expertise in capital markets, risk management, banking, and derivatives to assess the strengths and weaknesses of new regulations in response to the recent global financial crisis. "The Crisis of 2008 confronted even well-educated Americans with a flood of incomprehensible financial vocabulary, describing novel financial institutions and practices most of us had never heard of before. Now we have the 2,300-page Dodd-Frank Act, designed to provide the needed repair. Will it do so? What else will it do? How can we even start to think about these basic questions? Regulating Wall Street addresses these questions in a clear, direct style, taking us throught he primary parts of the Act one at a time, and providing informed, cogent economic analysis of each. A valuable standard source for future discussion." "Take the faculty of one of the best finance departments in the world. Ask them to analyze the new U.S. legislation on financial regulation, and to think about what the new law gets right, what it gets wrong, and how it is likely to shape the future of the financial system. With a bit of lucky, you get this very impressive book. An absolute must-read." "Regulating Wall Street goes a long way toward clarifying the intent of the various provisions of the Dodd-Frank Act and evaluating both its effectiveness and limitations. ...[A] useful reference work on an enormously clomplex piece of legislation, dealing with an even more complex financial reality." Follow the latest on the bill and financial regulation with the NYU Stern School Blog Regulating Wall Street http://w4.stern.nyu.edu/blogs/regulatingwallstreet/. Find out more about NYU Stern School of Business at http://www.stern.nyu.edu/.